There will be major changes to bus routes serving Lauttasaari from 15 August when HSL’s transport services switch to winter timetables. There will be no changes to the T services in the direction of Espoo, route 21V and night bus 20N. Two new bus routes, 20X and 21BX, will start operating. There will be direct bus links to Kamppi from all parts of the island, from Vattuniemi also to Asema-aukio. At the same time, routes 65A, 66A, 501 and 20 will be withdrawn. Routes 65A and 66A are renumbered 65 and 66 and no longer run between Rautatientori and Lauttasaari. 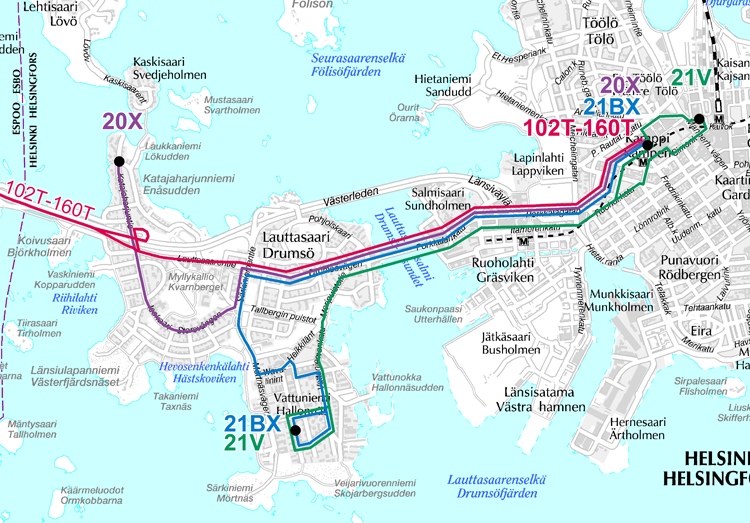 Route 21BX (Kamppi-Vattuniemi) will run along the route of buses 65A and 66A in Lauttasaari. From 15 August, journeys between Lauttasaari and Espoo are best made by T buses or via Ruoholahti. Route 20X replacing route 20 will run from Katajaharju to Kamppi, which means there will no longer be direct services between Lauttasaari and Erottaja. Buses 20X and 21BX will use bay 43 at the Kamppi terminal.